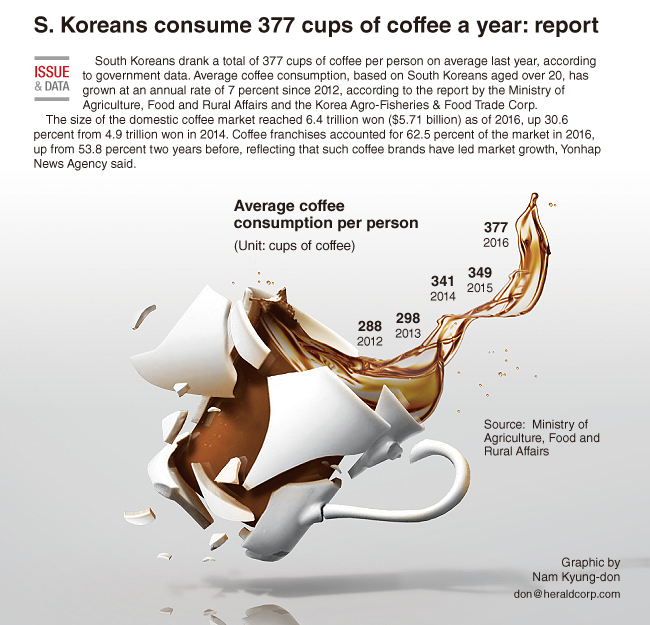 South Koreans drank a total of 377 cups of coffee per person on average last year, according to government data. Average coffee consumption, based on South Koreans aged over 20, has grown at an annual rate of 7 percent since 2012, according to the report by the Ministry of Agriculture, Food and Rural Affairs and the Korea Agro-Fisheries & Food Trade Corp. The size of the domestic coffee market reached 6.4 trillion won ($5.71 billion) as of 2016, up 30.6 percent from 4.9 trillion won in 2014. Coffee franchises accounted for 62.5 percent of the market in 2016, up from 53.8 percent two years before, reflecting that such coffee brands have led market growth, Yonhap News Agency said.